Gold Trailer is Gold with over 26 million views! 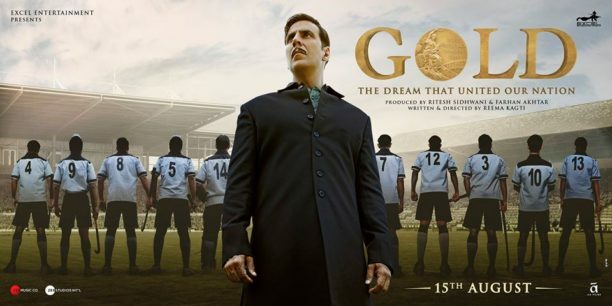 Starring Akshay Kumar, Gold, it seems, is winning gold because the trailer has hit over 26 million views on YouTube alone and it is still going up! Directed by Reema Kagti, the film is a historical sports drama inspired by the true story of India’s first Olympic gold medal as a free nation on the 12th of August 1948. The film traces the “golden era” of Indian hockey through the journey of Tapan Das, a young assistant manager in 1936, who dreams of playing for an independent nation. It highlights India’s emergence from the shadow of the British Empire as it meets the British hockey team on the field, this time as a nation of its own. An inspirational story of a team that fought all odds to bring their nation hope, pride and respect, Gold releases on August 14th, almost 70 years to the day the gold medal was won. Along with Akshay, Gold, stars Mouni Roy, Kunal Kapoor, Amit Sadh, Vineet Singh, Sunny Kaushal & Nikita Dutta.